“The underlying problem, which existed before the trade war, was overproduction. Farmers are almost too efficient for their own financial good,” Miedtke added. 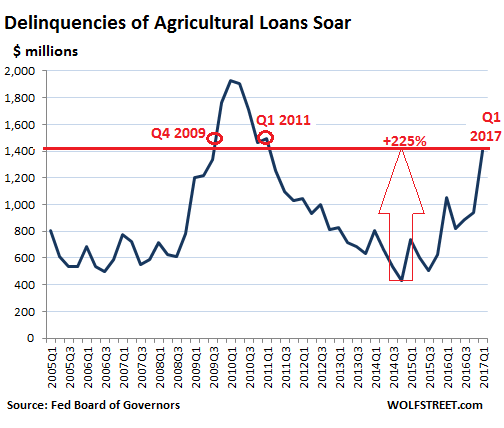 The bankruptcy wave of farms is also spilling into the ag loans market as the Ninth District’s 531 banks have reported an alarming rise in nonperforming ag loans. “Asset quality of ag loans at these banks in the bottom quarter of the performance distribution worsened significantly after the recession. They improved markedly by 2012 and saw a couple of years of very healthy rates (Chart 3). But by 2014, asset quality in this cohort of banks was worsening again. By the second quarter of this year, asset quality would fall below levels seen in the aftermath of the recession—a trend not seen in any other standard loan category, like residential and commercial real estate, or construction and industrial, or even consumer loans,” said Minneapolis Fed. The farm bust is not isolated to Ninth District states but also is showing up in other parts of the Midwest. A new report from the Federal Reserve Bank of Kansas City, which includes Colorado, Kansas, Nebraska, Oklahoma, Wyoming, and portions of Missouri and New Mexico, shows how farms in its district reported much lower income than a year ago. Kansas City Fed said farm incomes were expected to weaken into early 2019. The worst ag banking conditions were in states with the heaviest concentrations of corn and soybeans. The report also notes how farmers have started to deleverage, taking a page out of the GE playbook, with fire sales of land or equipment to make loan payments. In short, it appears that America’s farm bust has arrived; while it has been festering for years starting under the Obama administration, with President Trump’s trade war and China shutting out US farmers to its market the perfect storm has arrived. This entry was posted in Economy and tagged Agriculture, Farming on December 4, 2018 by Bone Fish. This entry was posted in Amerca, Economy and tagged farm credit, Farming, farmland, growing food on May 21, 2017 by Bone Fish. 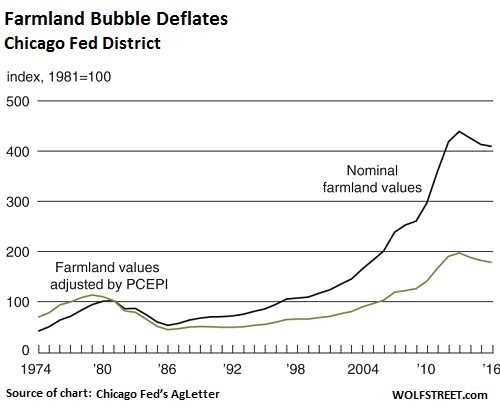 Not so long ago, US farmland – whose prices were until recently rising exponentially – was considered by many to be the next asset bubble. Then, exactly one year ago, the fairy tale officially ended, and as reported in February, US farmland saw its first price drop since 1986. It was also about a year ago when looking ahead, very few bankers expected price appreciation and more than a quarter of survey respondents expect cropland values to continue declining. According to several regional Fed reports released last Thursday, real farmland values in parts of the Midwest fell at their fastest clip in almost 30 years during the first quarter. Agricultural land values in the Seventh Federal Reserve District fell 4 percent from a year ago in the first quarter of 2016—their largest year-over-year decline since the third quarter of 2009. Cash rental rates for District farmland experienced a significant drop of 10 percent for 2016 compared with 2015—even larger than the decrease of last year relative to 2014. Demand to purchase agricultural land was markedly lower in the three- to six-month period ending with March 2016 compared with the same period ending with March 2015. Moreover, the amount of farmland for sale, the number of farms sold, and the amount of acreage sold were all down during the winter and early spring of 2016 compared with a year ago. Nearly two-thirds of the responding bankers expected farmland values to decrease during the second quarter of 2016, with the rest expecting farmland values to remain stable. As the WSJ added, falling crop prices have weighed on land values from Kansas to Indiana over the past two years as farm income declined and investors who had piled into the asset at the start of the decade retrenched. The St. Louis Fed region that includes parts of the U.S. agricultural heartland in Illinois, Indiana and Missouri reported the steepest decline, with the average price of “quality” farmland falling 6.4% in the quarter, the biggest decline since its survey began in 2012. The Chicago Fed said prices for similar land in its district fell 4% from a year ago, the seventh successive quarterly decline. Adjusted for inflation, prices in an area that includes parts of Illinois, Indiana, Iowa, Michigan and Wisconsin fell 5%, the biggest quarterly drop since 1987. Not even a recent short-term bounce in commodity prices – driven by China’s now concluded record loan expansion – is cause for optimism. Though some agricultural markets have rallied in recent weeks, prices for corn and wheat are still more than 50% lower than their 2012 peak, and the U.S. Department of Agriculture has projected that net U.S. farm income will fall this year to the lowest level in more than a decade. 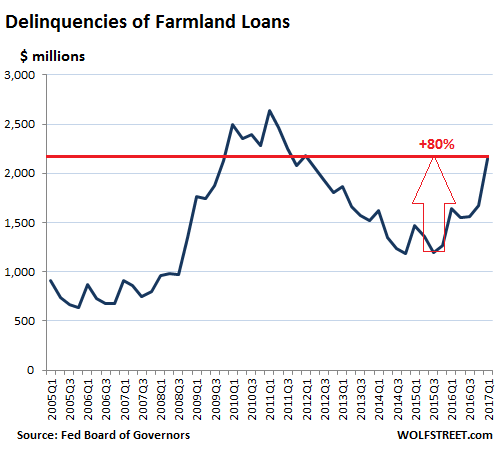 Another reason for America’s farmland recession: the drop in land values has been accompanied by deteriorating credit conditions, with more loans taken out to cover farm operations even as repayment rates fell on existing debt. It appears that in its scramble to save banks’ from their underwater energy exposure, the Fed forgot all about bailing out the American farmer. The Kansas City Fed said the weaker credit environment had left many growers unable to pay off loans extended to them in the previous year, forcing them to carry debt into 2016. It gets worse: loan-repayment rates fell for the 10th consecutive quarter, which the bank said was the longest run of deteriorating repayment rates since the early 2000s. 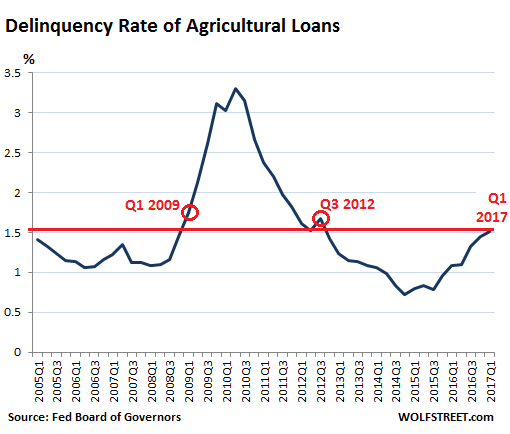 While farm loan delinquency rates remained low, growers with significant debt may face continuing stress. We spent the last few days in the Midwest visiting dealers, farmers, and a variety of industry experts. Overall, our sense is that the industry is “healing” but the down-cycle will be long as used inventories remain elevated, used prices are still “in discovery mode”, and farmers are staring at a fourth year of losses and asset write-downs; sentiment improved a little with the USDA’s demand outlook, at least for beans (but that may be short lived). We maintain our negative outlook for US Ag fundamentals. Among JPM’s other troubling findings is that farmers are not making money at current prices, and rents have started to move down, but not quickly enough; in IA, farmers must alert landlords in writing by September 1 if they want to renegotiate for the following year. Farmers have been buying equipment at auction when they perceive that it is good value, even though they may not need extra equipment; however, dealer used equipment prices continue to decline YoY, and the decline is accelerating as more used equipment is going to auction (at about a 20-30% discount). Titan dealer: At the peak of the cycle this dealer sold 23 combines per year; he sold three in 2015 and has 13 sitting in used inventory (about three years excess used inventory). He cannot sell new equipment until he sorts out the used equipment inventory (combines in particular), though he noted that he has sold six tractors YTD, more than he managed for all of 2015. Like other dealers we spoke with, Titan dealers are very hesitant to sell used equipment through auction as prices can be up to 25% lower than book value; he would prefer to sell used equipment at a loss rather than write down the value of his entire book. CAT (AGCO) dealer: This dealer noted that his dealership reported $186MM in sales at the peak in 2013, and this year his budget is to deliver $130MM, but he acknowledged that he may not make the budget as he too is struggling with excess used inventory. Unlike the DE dealer who simply stopped selling new equipment, this dealer has charged his sales force with a ratio of used for every new sale (tractors and competitor combines are 2:1 used vs. new, and for Lexion combines (Claas) the ratio is 3:1). He acknowledged that he may be taking a “death by a 1,000 knives” approach that could result in 2017 sales being down again. Here is JPM’s summary assessment on US farmer sentiment. It’s not good. The farmers we hosted remain pretty downbeat about the prospect for profits in the 2016/17 crop year, though they did sell most of the 2015/16 crop during the recent rally. Once again this year much of the focus was on rent, which remains elevated, and, while it may be inching lower, farmers in IA need to put in a written request for a re-negotiation by September 1 for 2017/18; those conversations are going to need to be uncomfortable this year. One farmer noted that he has 20+ landlords, so the process can be time consuming and emotionally exhausting. On a separate issue, the farmers noted that Farm Credit requested that farmers write down equipment values by 20% in January; the longer the down-cycle lasts the more stress on their balance sheets, especially for farmers renting a significant portion of their farmland. None of the farmers are rolling equipment right now, but they do not like to have equipment out of warranty as repair costs can run to $20K out of pocket. Beyond equipment, savings are being made on seeds (by moving to fewer traits or non-GMO), but not enough to break even at current prices. lenders are becoming more risk averse as the cycle extends. While America was so focused on whether or not there is a recession in the US manufacturing and oil & gas sector, it completely ignored the depression in America’s farming heartland. This entry was posted in Amerca, Economy, Real Estate and tagged Farm Land, Farming on May 15, 2016 by Bone Fish.